The ability to create a clan will be unlocked in The Division 2's story, and then all you need is three other people to join you. Ubisoft wants to create smaller communities who work together, so there's a 50 account limit to each clan, though payers can make up to four characters each. Duno if you made the A1 clan yet.. 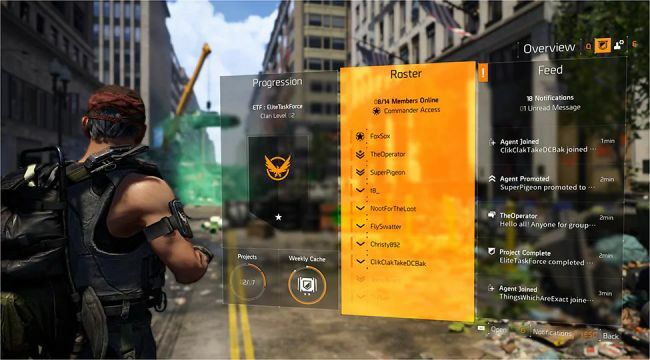 I've been mucking with it (really enjoy Division 2) made a Pyraets clan to see how it works..
You get your own 'wing' in the whitehouse, Only need 1 person to make it but you need 4 people in it to start leveling it up.. looks like a good 'extra' thing for the game. I havent seen or heard A! in Division 2 as of yet\ and Pyrates was a no go.. so for now I've teamed up with the chaps over at fragDNA (a gaming social community) if any one wants to have someone to play with in D2, good peeps.